We’ve been working on learning to read music. 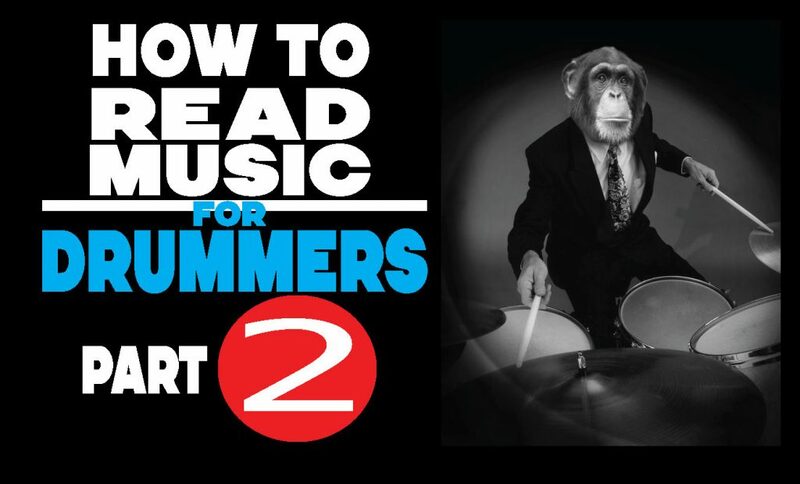 If you’ve been following this series, you’ll have checked out the previous two posts, Your First Drum Lesson and How To Read Music For Drummers Part One. If you haven’t been following it, feel free to check out those links. The idea is this: first, learn a few simple rock beats without any theory and using only physical movements that are easily explained (Your First Drum Lesson), then, learn what those beats look like on paper using rhythmic notation (How To Read Music For Drummers Part One), and then, use that new understanding of reading by learning a dozen simple rock beats (THIS post). It’s simple. And it works. Now, if you are an experienced drummer but you don’t know how to read, please try to be patient with these beats that you probably already know. The only reason I’m showing you these simple beats is to teach you the reading for them. Once you understand that reading, it’s going to open up a lot of doors for you to learn more efficiently and quickly. So I hope the fact that some of you may know these beats in your sleep doesn’t put you off — the point is to learn to read—and re-examining these simple beats will make learning to read easier for you. Take that PDF to the practice room if you like. Here’s the video!